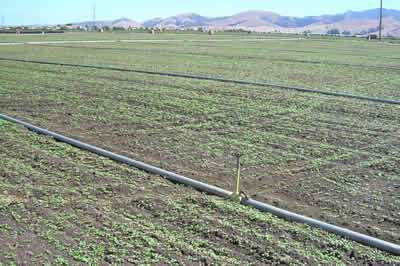 Cover crops have been grown in agricultural situations in California since the early part of the last century. They have been used in perennial crops and in a variety of field and row crops, either as an integral part of the annual cropping system or as a rotational crop. Cover crops are associated with soil benefits such as improved tilth and fertility, reduced erosion and crusting, and increased water-holding capacity. Field margins, roadsides, banks, levees and slopes can also be planted with cover crops for weed suppression. Cover crops also provide valuable cover, nesting and foraging habitat for a variety of wildlife and can support beneficial insects, which aid in pest control. A variety of perennial and annual grasses and forbs (broadleafed plants) can be used for cover crops as either single- species or multi-species mixes depending on the farmer’s needs. Fast-growing grass species provide high biomass for boosting organic matter in the soil, while some species of legumes can provide high volumes of nitrogen for the following cash crop. Mixed cover crops can be used to provide a combination of biomass and crop nutrient production. “Green manure” cover crops are typically incorporated into the soil before a cash crop is planted. In an orchard or vineyard setting, many annual cover crops can be managed to self-seed, minimizing needs for replanting and soil disturbance. Perennial grass cover crops can provide basic soil cover, and are typically selected to minimize water and sunlight competition with adjacent trees and vines. Cover cropping is useful in a variety of agronomic situations where either rainfall or adequate irrigation are available. In an annual cropping system, the cover crop can be planted after harvest of one crop and before planting of the next to provide soil management and fertility benefits. In a perennial cropping system, a cover crop can be managed between plant rows for similar benefits.